There is a lack of affordable housing options in the GTHA, and significant barriers exist for the homeless and other vulnerable communities to access affordable housing opportunities. Micro housing refers to tiny homes, micro-sized units in multi-residential or rowhouse complexes, a smaller archetype of detached secondary suites, or in general, dwellings that are much smaller in scale than conventional housing. It could be an ideal solution for vulnerable populations who are seeking and transitioning to more stable housing solutions. A growing number of towns and cities across North America and Europe have constructed micro housing as a practical solution to reducing homelessness and increasing affordable housing supplies. 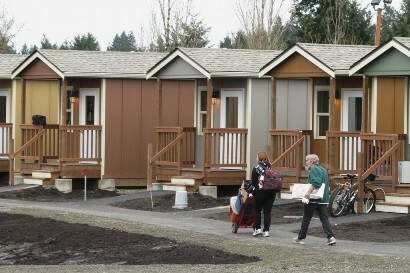 Micro house villages have shown successes in providing low barrier housing to the chronically homeless who often face and contend with issues of poverty, discrimination in the housing market, a lack of affordable housing and long waitlists for subsidized housing. Project partner Services and Housing in the Provinces (SHIP) sees micro homes as a potentially important component of homelessness prevention in Ontario, but regulatory, technical and costs barriers to implementing micro homes in the GTHA have not been thoroughly studied or identified. This project will review local planning policies and housing regulations to identify planning, policy, technical, and economic barriers to the implementation of micro housing in the GTHA. It will also identify potential barriers and strategies to address those barriers by looking to precedents in other international jurisdictions.